So, I really really should get back to blogging. Especially since I have been posting some ideas on the OD&D boards recently and should mirror them and perhaps expand on them here, rather than let them hide in the forum. As it so happens, though, there's something else that just happened which may impact this blog. When LiveJournal's ownership changed a couple years back and everyone was worried about the changes, I backed up my LJ account, as many others did. But I left my blog there rather than moving it somewhere else. But I'm thinking now is the time to just delete that profile and salvage what I can. Some of my posts there were, in fact, about some RPGs I was designing. I'm thinking of re-posting them here, even though these projects are either abandoned or on the backburner. The one way, way in the back. Just in case some of the material might be useful to someone. All these posts will be marked as reposts with the original date noted, and they will be interspersed with new stuff I'm working on now, so I'm not going to swamp my blog with a rehash of out of date material. I was thinking of starting another Blogger blog for the non-gaming stuff. Most of my LJ posts aren't worth reposting, because they are only relevant to myself and the friends who were reading my posts back then. But I might repost some social commentary or other witty insights (ha!) on such a blog, maybe even get back into non-RPG blogging on an occasional basis. Haven't decided yet. 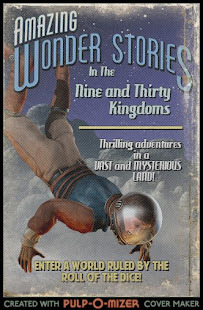 When discussing blog-moving plans with my friend Colin, he suggested I could merge some of my non-RPG posts into this blog, The Nine and Thirty Kingdoms, and just use tags so people could filter out the material they don't want to see. And I thought, "Well, not most of that stuff... But the media stuff? Maybe?" I know many of the RPG bloggers I read do include a lot of commentary about movies, TV, books, and comics in their blogs, but I've always tried to keep this an RPG-only blog. I wanted it to be very focused, since I figured most people who come here looking for terrain generation tips or random tables aren't interested in my opinion of The Fifth Element. (Spoiler: Again, No.) But on the other hand, I kept that stuff out because I had another place to post it. Even if I used that place less and less as the years rolled on. Now that it's not going to be there anymore... Should I? How do people feel about me ranting about movies? Not all of which are fantasy and sci-fi, some of which would be very hard to relate to RPGs? It wouldn't just be reposts, either. I've had the urge to write a thing or three about some recent stuff, especially the Doctor Strange movie, so I could post about that, too. I'm just not sure how people are going to feel about that. Put your movie andownload media blogging here. It's a movie. But just barely. I'm glad we agree on at least one thing. I was so happy to see you post something, then that Fifth Element thing...WHYYYYYYY!?!? ;) it's mindless frippery, and fun! I am happy to see ya post again Talysman. Mixing purpose is fine, just tag 'em and we can parse it our own way. Welcome back! As for WHYYYYYY...? I suppose I should post my Fifth Element review as quickly as possible. Nah, I'd say keep the non-gaming stuff off here. But I'd still be glad to see posts of any kind. What about non-RPG gaming. Like, oh, Minecraft or Skyrim?